In the land of a thousand and one nights stories, I finished reading 46 books, and am currently reading two. Still, my Amazon book list is at 511 and counting. I find it frustrating. In fact, I find reading itself to be frustrating. What to read? What to focus on? And how can you read? – if every second something interesting gets published. I try to finish a book as fast as I can, and while I’m still reading the book on my iPad, I’m thinking about this other book on my Kindle, and while I’m thinking about it, I’m debating whether I should read the introduction for the new book I just downloaded. I really get frustrated. I’m serious. What I really wish is to be able to read these interesting books ALL at once. I find everything important – it’s like: how can I live without knowing having this knowledge? Anyway, the end of 2016 is just around the corner. It has been my tradition for past two years now to recommend one book out of all the books I read since the beginning of the year. I believe the greatest book is the one that connects the content to our own experience. It makes you shout “Yes…this is how I felt”, “This is what I mean!” – It validates us. 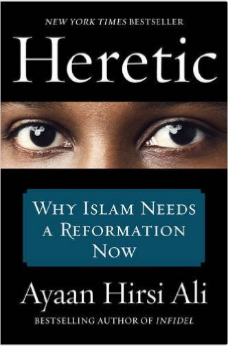 The author Ayaan Hirsi Ali is the Martin Luther and John Calvin of the Islamic world. She has taken a noble cause to promote a reformation in Islam. There are a few moments in my life that have given me personal pleasure, like being able to make certain statements publicly. My ability to opine freely on certain topics about Islam was restricted in my previous years of living in Iraq. Ayaan Ali spoke my heart and wrote the book I wish to write, every statement hits a vestigial feeling inside me. Well, she was a Muslim who lived in Mecca – an insider who wrote from an outsider detached perspective about the problems in Islam. She wrote a valiant and a brilliant polemic about Islam. I have great admiration for Ayaan. People like her, Ayad Jamal Addin, Brother Rasheed, Salman Rushdie, Christopher Hitchens, Kurt Westergaard, and Geert Wilders. Their names will go down in history for their stands on intellectual freedom. I hope my recommendation for the “Heretic” this year will encourage people to read more about our present day problems and heroes. Finally, if you are interested to see the list, then everything I read is pinned on Pinterest 2016 Books board, under each book, I tried to write who recommended it. I also wrote reviews for some books on Amazon. In my previous book recommendations like in 400,000 Pages in Baghdad, I wrote about the ugly side of reading 100 books. In 300,000 Pages and one book, I explained how I select the books I read. And last in Happiness from Lalastan, I wrote about how the Privileged Rich West seems to live in a bubble of their imagination and the stupidity of certain claims about Happiness. In Life Goal of Reading 10,000 Books, I explained the reason for trying to cross the Rubicon of my cognitive limits. I hope you get a chance to check them out. If I were to pick the first and second runners up, they would be “Expert Political Judgement” by Philip Tetlock and “Stonewalled” by Sharyl Attkisson. Also, I truly enjoyed reading “Sapiens” by Yuval Noath Harari, “The Existentialist Café” by Sarah Bakewell, “Open” by Andre Agassi, “Disrupted: My Misadventure in the Start-Up Bubble” by Dan Lyons, and “Mating in Captivity” by Esther Perel – but that’s other subjects/blogs. Make 2017 a reading year! P.S.1 Feel free to share, like, and comment on Facebook. P.S.2: If you enjoyed the story, please click follow at top right corner.